With experience, education, and level-headedness, it is critical to make strategic financial decisions and use the market to meet your short and long-term goals. Of course, not everyone has the expertise—or the time—to dedicate towards tracking the intricate details of their finances, which is when enlisting the help of a financial advisor in Kansas or Missouri can be a worthy investment. The financial advisors in and around Kansas and Missouri may be thousands of miles away from Wall Street, but that doesn’t mean its influence doesn’t reach the Heartland. Market fluctuations are felt nationwide and worldwide. This makes knowing what you’re doing highly important. Without a good wealth manager in Kansas or Missouri, your assets will be increasingly vulnerable to an often-chaotic market. Securing your wealth, planning for the future, and optimizing your investments are only a few of the necessary steps you’ll need to take to weather the inevitable financial storms. To help you get started on securing a strong financial future for yourself and for your loved ones, we have identified the best financial advisors in Kansas City, MO, and Overland Park, KS, including the surrounding areas. When it comes to evaluating KC financial advisors, there are typically two types of firms to consider: fee-only and fee-based advisors. How do you know which type of Kansas City financial advisor is right for you? Below, we’ll provide you with a brief overview of everything you need to know about the differences between fee-based and fee-only financial advisors in Kansas and Missouri. When a financial advisor in Kansas City or the surrounding area says that they are “fee-only,” this means that they do not accept commissions or third-party referral payments. Because an advisor’s only source of income comes from the client, a fee-only pricing structure minimizes the inherent conflicts of interest that come along with recommending and selling investment products. In short, a fee-only financial planner in Kansas or Missouri is in a better position to act solely in the interest of their clients. Fee-based firms will receive some direct compensation from clients but are free to accept commissions from the companies who provide their financial products. While a fee-based structure does create some potential conflict, many fee-based investment firms are also fiduciaries, which often counteracts the potential for conflict. As a fiduciary, Overland Park and KC financial advisors are legally responsible to fully disclose any conflicts of interest and are required to put the interests of their clients ahead of their own, regardless of their pricing structure. Below, please find the detailed review of each firm on our list of the best firms offering wealth management in Kansas City and the surrounding areas. We have highlighted some of the factors that allowed these financial advisors in Kansas and Missouri to score so high in our selection ranking. Founded in 1990, Atwood & Palmer, Inc. is a boutique firm of financial advisors in Kansas City, Missouri, defined by their core ethics of trust, communication, and client service. Although Atwood & Palmer lists themselves as a fee-based Kansas City wealth management firm, they do not accept commissions and are not registered to sell insurance. As always, we recommend that confirming fee structure before partnering with any financial advisor in Kansas City and the surrounding areas. As a boutique firm, the low client-to-advisor ratios at Atwood & Palmer allow for personalized, one-on-one attention throughout the Kansas City wealth management process. As such, the Kansas City financial advisors at Atwood & Palmer give you their full attention from day one. Counselors are not overloaded with clients, and as a result, their time and availability does not become strained. This means that when you hire a Kansas City financial advisor at Atwood & Palmer to manage your wealth, you’re hiring someone who will be there for you whenever you need assistance, rather than speaking once or twice a year. 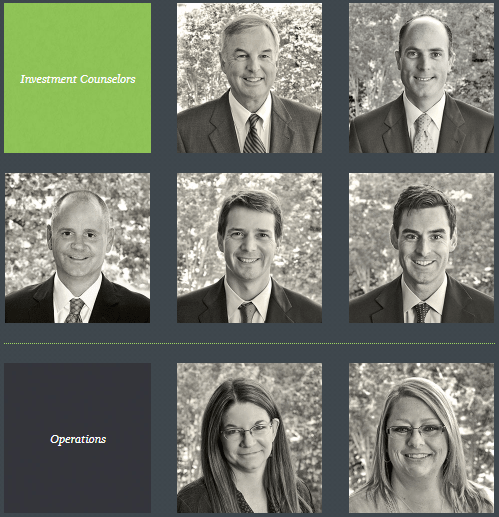 The Investment Counselors on the Atwood & Palmer team have over 100 years of combined experience. Combined with founder Bill Atwood’s 47 years working in the industry, this makes Atwood & Palmer one of the most experienced financial advisors in Kansas City, MO. That experience is strengthened by their education and credentials, including MBA and CFA designations. With Atwood & Palmer, you get access to Kansas City financial advisors who have both the tenure and the know-how to effectively manage your wealth. Atwood & Palmer joined our list of the best financial advisors in Kansas City because they are committed to their clients. Not only do they take the lead on communication, but they are always available for their clients to initiate contact, too. One significant downfall, however, is that the firm does not have any detailed information on their financial services. While their Kansas City financial advisors can assist with common tasks like wealth management, retirement planning, college funding, and more, potential clients are left in the dark as to how these services are rendered. By elaborating their processes and approach to each financial service, Atwood & Palmer could easily improve both their value proposition to clients and their ranking as a top financial advisor in Kansas City, MO. Buttonwood Financial Group is a Kansas City financial advisor that was founded in 2002 by Jon McGraw. Buttonwood is a fee-based firm offering wealth management in Kansas City, but we have included them on our list for their independent structure and the comprehensive services they provide. No matter what service you choose, the Kansas City financial advisors at Buttonwood Financial Group can tailor a plan to your needs, creating a unique “box” for your specific financial situation. As such each plan is customized and personal, giving you and your money the careful, individualized attention you’re looking for. As a top financial advisor in Kansas City, MO, Buttonwood provides dynamic and comprehensive financial planning to set clients up for long-term success. As one of the top Kansas City financial planners, Buttonwood Financial Group excels at making the process of improving your financial health both accessible and attainable through uncomplicated communication and personalized stories from real-life clients. With a focus on building relationships, a unique dedication to supporting the local community, and truly customized financial plans, Buttonwood Financial Group is one of the best Kansas City financial advisors to consider partnering with this year. Founded in 2008, Fortune Financial is a financial advisor in Overland Park, KS, offering decades of experience and a full spectrum of financial planning and wealth management services. Our review could not confirm whether Fortune Financial uses a fee-based or fee-only structure; as always, we recommend confirming fee structure before partnering with any financial advisor in Kansas City and the surrounding areas. As one of the top financial advisors in Overland Park, KS, Fortune Financial offers an impressive range of comprehensive, customized financial services. As a top financial advisor in Overland Park, KS, Fortune Financial excels at providing comprehensive, detailed financial services to serve a range of financial planning and wealth management needs. Conversely, where the firm could improve is in how their fee structure is communicated to potential clients. Without a solid understanding of whether the firm uses a fee-only or fee-based structure, potential clients may find it challenging to fully evaluate the firm. By clarifying between the fee-only listing on their website and the fee-based listing on their ADV, Fortune Financial could easily improve both their value proposition to clients and their rating as a top financial advisor in Overland Park, KS. Founded in 2007, Frontier Wealth Management, LLC is a family-owned financial advisor in Kansas City, MO, with additional offices located in Wichita, St. Louis, and Denver. Frontier is a fee-based financial planner in Kansas City. We have chosen Frontier as one of the top Kansas City financial advisors for their team-based approach, independence, fiduciary commitment, and wide range of financial services. Because of Frontier’s team-oriented approach, they can provide a suite of comprehensive, harmonized services. From estate planning to tax planning, and from investment strategies to insurance planning, Frontier’s team of financial advisors in Kansas City puts their collective knowledge to work in rounding out your plan. Moreover, each Kansas City financial advisor will drill down further into their specific concentration, giving you a more profound level of expert advice than what you’ll find with most financial planners in Kansas City. As a result, your plan will be a precise reflection of your needs while better serving you in reaching your goals. 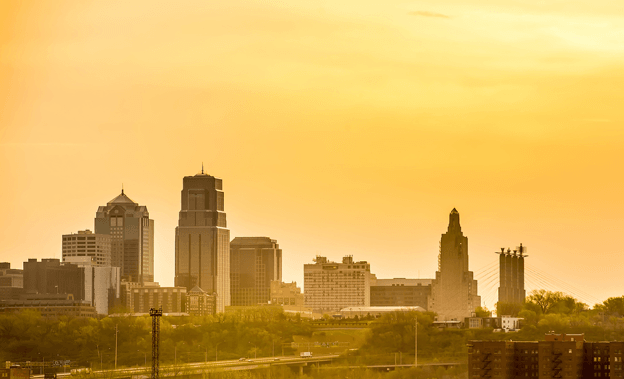 As one of the best Kansas City financial advisors, Frontier Wealth Management offers the advantages of a full suite of services and a team-based approach to wealth management. Additionally, Frontier also includes a wealth of information and resources on their website for investors and clients who want to learn more about money management, providing a space for clients and investors to start improving financial literacy on their own time. With an independent structure, a fiduciary commitment, and a client-centric approach to all wealth management services, Frontier Wealth Management earns a 5-star rating as one of the best Kansas City financial planners. Founded in 1976, Searcy Financial is a fee-only financial advisor in Overland Park, KS that understands that building wealth is the means for a fulfilling life. As such, their primary objective is to use smart wealth management to help their clients lead more purposeful and intentional lives. Successfully managing personal wealth means taking inventory of your resources and figuring out how to properly allocate them in a big picture perspective, which is something a financial advisor in Kansas can help with. Preparing for the future can be challenging for those with a family member with special needs. While many firms can help families navigate almost any financial situation, Searcy Financial is one of the few Overland Park financial advisors to explicitly address helping family members create long-term financial support for those with special needs. As a top Overland Park financial advisor, Searcy Financial helps families find the resources they need and supports them through the process of navigating Special Needs Trusts and asset protection. Their objective is two-fold: securing their future and giving clients the peace of mind to enjoy their time with their family instead of stressing about their financial well-being. With an independent, fee-only structure and a focus on providing financial services that are both comprehensive and collaborative, clients will find plenty of distinct advantages when partnering with Searcy Financial. Their unique financial services—like Special Needs Planning and Physicians Services—provide additional focus that many larger firms skip entirely, adding to the firm’s overall value and solidifying Searcy Financial as a top Overland Park financial advisor. Sound Stewardship, LLC is a fee-only financial advisor in Overland Park, KS that provides wealth management from a foundation of biblical values. Ultimately, Sound Stewardship seeks to help clients make their dreams a reality while positively impacting the world around them. While financial planning and wealth management are staples among most financial advisors in Kansas, Sound Stewardship provides uniquely comprehensive financial planning services. Such a thorough review warrants the name “comprehensive,” and it is one of the most comprehensive systems you’ll find among financial advisors in Overland Park, KS. At Sound Stewardship, these Overland Park financial advisors do more than give lip service to the basic principles of sound money management. Instead, they formed their entire philosophy around them, and each client’s financial plan is crafted according to the same ideas. For clients that prefer to partner with a firm that shares their biblical values and beliefs, Sound Stewardship is a great fit. Even for clients that may not share the same belief system, the Overland Park financial advisors at Sound Stewardship operate on a solid foundation of transparency and communication, two crucial components of any successful wealth management endeavor. With a fee-only structure and a comprehensive financial planning approach, Sound Stewardship is one of the best financial advisors in Overland Park, KS to consider partnering with this year. Based in Kansas City since 2001, Sterneck Capital Management is a Kansas City wealth management firm was first formed in New York City in 1989. Sterneck Capital management does not explicitly say whether they are a fee-based or fee-only firm; however, their ADV does outline their compensation structure, which includes asset-based management fees, flat fee rates, or performance-based fees. As a top financial advisor in Kansas City, Sterneck Capital holds itself to the fiduciary standard when managing your money, working only in the best interest of their clients. As a result, they are completely open and transparent—but most importantly, the fiduciary standard ensures that all financial advice comes free from bias or interest in personal gain. Not only is this a moral code, but it is also a legally binding one, as the fiduciary standard keeps investment advisors accountable for every recommendation they make, providing the golden standard in trust within the client-advisor relationship. Each investor’s needs are different, and their individual financial situation is too. Because of this, what works for one client will not necessarily work for another when creating a plan for wealth management in Kansas City. As a Kansas City wealth management firm with a fiduciary commitment, Sterneck Capital Management provides an ideal match for many clients looking for a transparent, trustworthy relationship with a financial advisor. At the same time, however, our review found that Sterneck may be missing opportunities with clients by not publicly advertising whether they are fee-only or fee-based, as many clients prefer to work with a specific structure. Additionally, although the staff brings decades of experience, it’s worth mentioning that Sterneck has only one CFP® professional. Compared to competing financial advisors in Kansas City, this lack of credentials poses a significant disadvantage. By clearly stating their fee structure and committing to increasing the industry-specific certifications of the staff, Sterneck Capital Management could easily improve both their value proposition to clients and their rating as a top financial advisor in Kansas City. 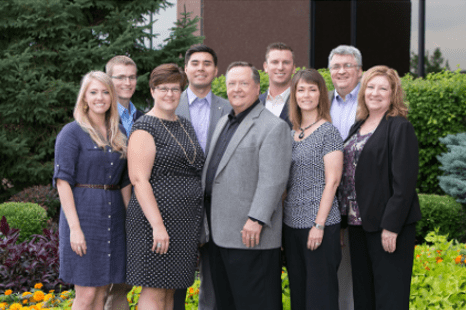 Established in 1993, Sunrise Advisors, Inc. is an independent, fee-only financial advisor in Leawood, Kansas that has been family-owned for multiple generations. Sunrise Advisors prides itself on doing what’s best for its clients. They operate according to the fiduciary standard and receive their compensation through a fee-only structure. From a client’s perspective, when you hire Sunrise, you are hiring a wealth management firm in Kansas that has taken the effort to prove its commitment to transparency and client care. Their legal obligation is to benefit you, not to line their own pockets at your expense. To that end, with Sunrise Advisors, you can be assured that you are partnering with a Kansas financial advisor who is unbiased, honest, and upfront with you every step of the way. Sunrise offers a comprehensive suite of financial planning services. The range of assistance offered by this Kansas wealth management firm makes it a “one-stop shop” for financial advice. Plans are crafted through the collaborative expertise of Certified Financial Planners, Chartered Retirement Planning Counselors, attorneys, and advisors to ensure that all angles are thoroughly covered. As an independent, fee-only firm, Sunrise Advisors provides clients with two crucial components of any successful financial planning relationship: trust and transparency. The firm also places a strong emphasis on creating comprehensive financial plans for each client, solidifying Sunrise Advisors as one of the best financial advisors in Kansas. Founded in 2004, The Retirement Planning Group (TRPG) believes that retirement planning should transparent, family-oriented, and open. TRPG is a fee-based firm; however, we have chosen them as a top financial advisor in Overland Park, KS for their independence, fiduciary commitment, experience, and wide range of financial services. As a top financial advisor in Overland Park, KS, The Retirement Planning Group recognizes that financial planning is a stressful topic—and rightly so, since it inherently requires an honest, detailed look at your long-term goals, needs, priorities, and even health. With advisement across a variety of financial topics, clients can rest assured that TRPG is prepared to tackle any financial challenge that comes their way. Investing at an early age is integral to securing a comfortable retirement, and TRPG strives to make the process as convenient and as beneficial as possible. Through Foundations, clients can learn how to address areas such as cash flow and budgeting, debt and risk management, tax efficiency, college planning, investment strategies, and company benefits. Along with a client-centric focus, their relationship-driven company culture is a strong thread in everything that The Retirement Planning Group does, generating stability and ensuring continued success within the financial advisory industry. 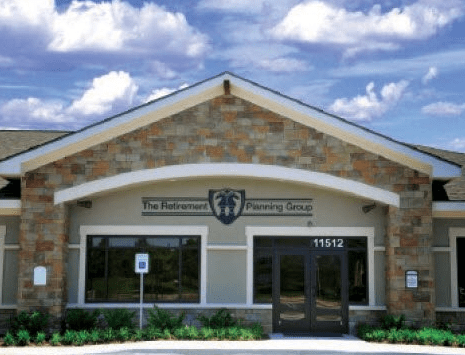 With an expert team, low-cost portfolios, and a firm dedication to providing high levels of client satisfaction, The Retirement Planning Group is one of the best Overland Park financial advisors to consider partnering with this year. Windward Private Wealth Management, Inc. is a Registered Investment Advisor with offices in Overland Park, Kansas and North Kansas City, Missouri. These KC financial advisors hold themselves to the fiduciary standard and receive their compensation through a fee-only structure. Windward is fee-only, meaning they will charge you a fixed fee for drawing up and implementing your financial plan. This wealth management firm in Missouri and Kansas receives no incentives, no commission, and no extra fees based on the recommendations you receive from the members of the Windward team. This helps you ensure that anything your financial advisor suggests putting in your portfolio or plan is recommended with your best interests in mind. Not only is Windward morally inclined to do this, but legally obligated to as well, as the fiduciary standard holds them accountable when recommending products and strategies to clients. To guarantee that each facet of your financial life is taken into consideration, this financial planner in Kansas City takes you through a 5-step plan to customize each client’s financial needs and future goals. 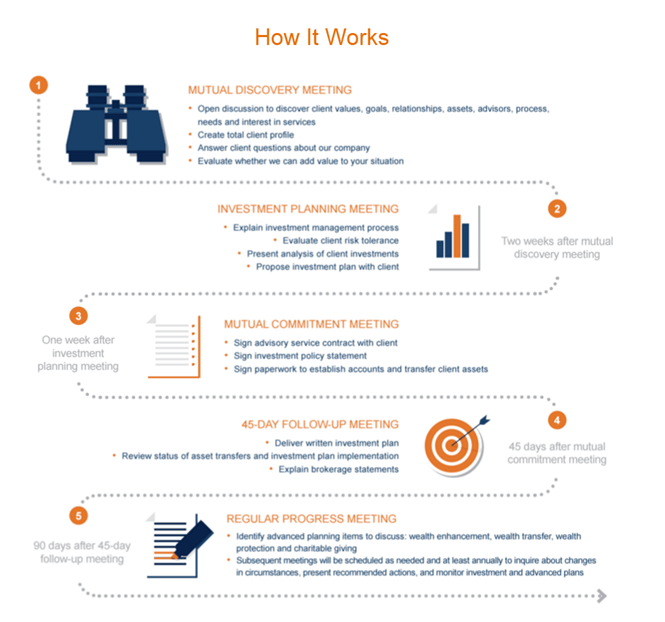 Mutual Discovery Meeting: Your financial planner in Kansas City or Overland Park will get to know you, your values, goals, assets, needs, and so on. You can ask questions and, together, you decide whether Windward is a good fit. Investment Planning Meeting: Windward takes you step-by-step through their investment management strategy, assesses your financials for risk tolerance, and reveals their recommended investment plan personalized to your needs. Mutual Commitment Meeting: One week later, you sign your contract with Windward along with the necessary paperwork to open your account and transfer your investments. 45-Day Follow-up Meeting: Your KC or Overland Park financial advisor will produce your finalized investment plan. You’ll also review the transfer of your assets, plan implementation, and brokerage statements. Regular Progress Meeting: In addition to reviewing the progress of your portfolio, your financial advisor in Kansas City or Overland Park will consult with you about additional financial planning services like wealth transfer, philanthropic giving, and wealth protection, among others. From there, you will meet with your financial advisor at least once a year and you can meet with your advisor whenever you need. Otherwise, they remain available by phone or email. As a fee-only firm with a fiduciary commitment, Windward Private Wealth Management represents the ideal partnership with a financial advisor. Not only do these Overland Park and Kansas City financial planners have your best interests in mind, but they will always provide the utmost transparency while doing so, instilling trust and supporting long-term relationships. With a wide range of financial services and an in-depth approach, Windward is one of the best financial advisors in Kansas City and Overland Park to consider partnering with this year. 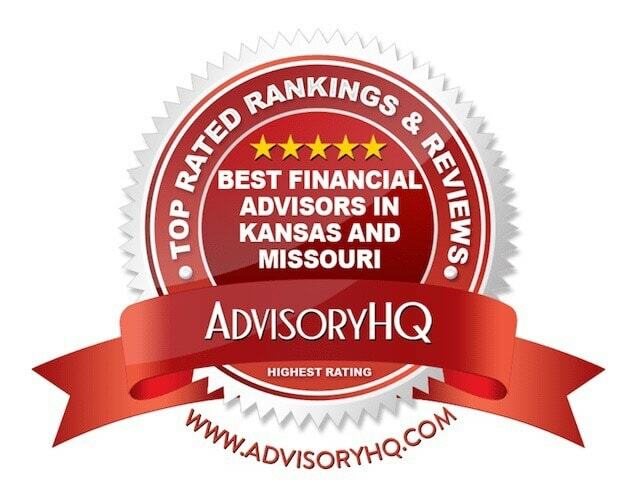 Luckily for investors in Missouri and Kansas, there is no shortage of qualified, experienced, fee-only, fiduciary financial advisors in the area. As the list above demonstrates, when you entrust your money to one of these companies, you’re putting your future and the future of your family and loved ones in good hands. But don’t take our word for it—most of the wealth management firms in Kansas and Missouri we’ve reviewed are more than happy to set up a free, initial consultation with you. They are eager to hear your story, to tell you theirs, and to earn your trust and your business. Feel free to contact any one of these financial advisors in Kansas City, Overland Park, or Leawood today to get started on the path toward a secure future.